This article is about the town in Massachusetts. For the county in which this town is located, see Essex County, Massachusetts. For the county in England, see Essex. For all other uses, see Essex (disambiguation). Essex was incorporated as a town in 1819. It was previously a part of the town of Ipswich and was then called Chebacco Parish. The first European settlers arrived in 1634. At that time, the land formed part of an area inhabited by Native Americans of the Agawam tribe. The name Chebacco is Agawam in origin and refers to a large lake whose waters extend into neighboring Hamilton. Conomo Point, the easternmost part of the town, is named for the Sagamore or Chief of the Agawams, Masconomo, the leader of the tribe in the late 17th century. 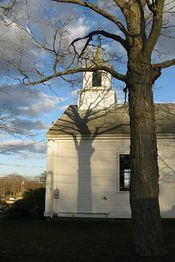 Early on, Chebacco Parish lobbied for status as an independent town, asking for permission to build a meeting house. In colonial times, the existence of a meeting house in a settlement conferred de facto autonomy, so Chebacco Parish was denied permission to build such a structure. Popular history tells that one written dictate was issued stating that "no man shall raise a meeting house", so the residents of the settlement interpreted it as to mean that women would be allowed to do so. It is reported that a local woman, Madam Varney, assembled the town's women and construction of a meeting house was carried out by them while the men looked on. In the town the population was spread out with 24.2% under the age of 18, 5.3% from 18 to 24, 30.1% from 25 to 44, 26.9% from 45 to 64, and 13.6% who were 65 years of age or older. The median age was 40 years. For every 100 females there were 96.7 males. For every 100 females age 18 and over, there were 97.4 males. Essex's municipal offices are housed in the Essex Town Hall and TOHP Burnham Library, an exuberant Shingle Style building erected in 1893-94. Essex's small size makes New England's traditional direct-democracy style of government practical. The residents of Essex elect a board of three selectmen to carry out the routine business of local government while relying on the town meeting system to decide major issues. In recent years, the most important of these issues has been the leasing of public lands at Conomo Point, a school regionalization plan with Manchester-by-the-Sea, and the construction of infrastructure for dealing with sewerage. In 2002 the town hired a Town Administrator to work for the board of selectmen and oversee day-to-day operations. Policy and major decisions are still verified by the town meeting. Essex has one public school, Essex Elementary School, that offers instruction to children from pre-kindergarten to grade 5. The Essex Middle School had previously functioned to educate students to grade 8. But recent regionalization has brought the Essex Middle School children into the Manchester Essex Regional Middle School, located in the same building as both the Manchester Essex Regional High School and the previous Manchester Middle School. The town of Essex does not include a high school, and in years past has had to send its grade 9 through 12 students to neighboring districts. Arrangements in the past have included sending high school students to Manchester-by-the-Sea, Gloucester and Hamilton-Wenham public schools. In 2000, the town approved a plan to create a regional school district with Manchester-by-the-Sea. Under the plan, the two towns are served by a consolidated school system, the 'Manchester-Essex Schools', and a new high school. This marks the first time Essex did not have to send its students to another district to attend high school. In early 2006, the voters of both Essex and Manchester by the Sea approved a new $49 million regional school project for the purpose of building a new Middle School and High School. Both projects were approved at Town Meeting and then again at the ballot box for a debt-exclusion which will permit the towns to raise funds in excess of the 2.5% property tax cap mandated by Prop. 2.5. A similar $36 million plan three years earlier was defeated in Essex at the polls and approved in Manchester. Construction was completed in the summer of 2009, and students began attending the new middle-high school in the fall of 2009. The main sources of income for the town of Essex are the shellfish industry and tourism. The fried clam was reportedly "invented" in Essex by Chubby Woodman early in the 20th century. Due to the exceptional quality of the clam that lives in the tidal river in Essex, local restaurants thrive by preparing it along with other types of seafood. Tourists are mainly drawn to Essex for its restaurants, but in recent years leisure activities such as excursions down the Essex River in boats or self-guided kayak trips have become increasingly popular. One major disadvantage that Essex has is that its only beach is not easily accessible by land and as such is not a major draw for tourists as are the beaches of neighboring Gloucester, Ipswich and Manchester-by-the-Sea. Essex, with an abundance of natural beauty, must also compete with nearby Rockport for tourists in search of quaint New England charm. In the last two decades, there has also emerged a flourishing antiques trade in Essex. The town now boasts of being the municipality with the greatest number of antique shops per square mile in the US. The town of Essex was once home to a prosperous shipbuilding trade. This industry accounted for most of the revenue of the town from the days of its settlement as Chebacco Parish until the early part of the 20th century. Once a leading supplier of schooners for Gloucester and other Atlantic fishing communities, Essex did not adapt to the transition from sail-powered wooden ships to engine-powered metal vessels, and this activity disappeared around World War II. There have been recent attempts to return to shipbuilding on a small scale as a tourist attraction and they have met with some success. The Essex Shipbuilding Museum stands as a living testament to the wooden shipbuilding industry and the neighboring boat yard owned by generations of the Burnham Family still constructs and launches classic wooden ships built in the Essex tradition. In 1995, the feature film The Crucible, starring Winona Ryder and Daniel Day-Lewis, was filmed in Essex. Winona Ryder stayed in a private home on Western Avenue during the filming of The Crucible. Grown Ups, starring Adam Sandler, was filmed in Essex during the summer of 2009, primarily at Chebacco Lake. The movie also shot at Woodman's restaurant in Essex; in Southborough, Massachusetts; and at Water Wiz in Wareham, Massachusetts. Rufus Choate, (1799–1859), lawyer, orator, US congressman, senator. A close friend of Daniel Webster, Choate was chosen to serve out his unfinished term in the US Senate. Choate is considered today to be one of the fathers of traditional American conservatism. Choate Street, named after the Choate family, connects John Wise Ave to Chebacco Road. Evan Dando, founder and frontman of the popular alternative rock band The Lemonheads, is an Essex native. Michael Gerald Ford (born 1950), eldest son of U.S. President Gerald R. Ford lived in Essex at the same time his father occupied the White House. Ford made Essex his home while studying at nearby Gordon–Conwell Theological Seminary. John Wise (1652–1725), pastor of Chebacco Parish (when this parish remained part of the neighboring town of Ipswich), who spoke out against "taxation without representation" more than a half century before the American Revolutionary War. John Wise Ave (a section of MA Route 133) is named for him. Augustus Gardner Means (1925-1994), member of the Massachusetts Governor's Council (1959-1961) and Republican candidate for lieutenant governor in 1960. Recipient of the Distinguished Service Cross for heroism during World War II. He was a descendant of Henry Cabot Lodge and Augustus Peabody Gardner. ^ "Profile of General Population and Housing Characteristics: 2010 Demographic Profile Data (DP-1): Essex town, Essex County, Massachusetts". U.S. Census Bureau, American Factfinder. http://factfinder2.census.gov. Retrieved August 31, 2012. ^ "Geographic Identifiers: 2010 Demographic Profile Data (G001): Essex town, Essex County, Massachusetts". U.S. Census Bureau, American Factfinder. http://factfinder2.census.gov. Retrieved August 31, 2012. Anderson, Philader. 1830 Map of Essex. Beers, D.G. 1872 Atlas of Essex County. Town of Essex Map - Plate 75. Click on map for a very large image. This page uses content from the English language Wikipedia. The original content was at Essex, Massachusetts. The list of authors can be seen in the page history. As with this Familypedia wiki, the content of Wikipedia is available under the Creative Commons License.